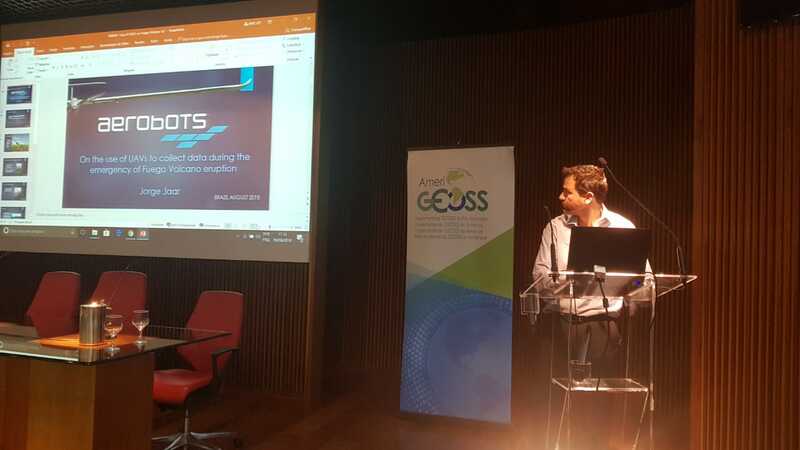 Between the 6th and 10th of August, the AmeriGEOSS week 2018 was carried out in the National Institute of Space Research (INPE, by its acronym in Portuguese), Sao Paulo, Brazil. Aerobots, represented by its CEO Jorge Jaar, participated with the presentation “On the use of UAVs to collect data during the emergency of Fuego volcano eruption”. The AmeriGEOSS initiative is a framework coordinated by the National Aeronautics and Space Administration (NASA), that seeks to promote the collaboration and coordination among the GEO members in the American continent, “to realize a future wherein decisions and actions, for the benefit of the region, are informed by coordinated, comprehensive and sustained Earth observations and information in the four Societal Benefit Areas: a) Agriculture, b)Disaster risk reduction, c) Water, and d) Biodiversity and ecosystem monitoring.” Within this framework, AmeriGEOSS week is planned to become an annual meeting where the AmeriGEOSS community gathers to reflect on progress, plan to meet the priority needs in the focus areas identified in the region as highest priority (mentioned above) and provide training in the use of Earth observations. Aerobots was invited to participate in the event due to the positive impact that the products generated during the Fuego volcano eruption had on members of the GEO group and NASA. Aerobots presentation indicated that the use of autonomous aircraft as immediate source of information for search and rescue activities aims to be feasible and safe during emergencies when satellites are not able to provide information. Aerobots © 2019. Todos los derechos reservados.